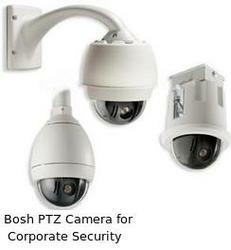 We make available our clients Bosh PTZ Camera at industries leading prices. Our range is highly appreciated among our clients as it immediately deliver the event video to you directly to your i Phone/Android Mobile devices to let you know what just happened instantly. Designed for ease-of-use, Bosh PTZ Camera is built around a system of interchangeable modules that allow you to update camera functionality quickly and cost effectively.